Delicious roasted & flavoured seed blends; ideal for snacking on, or sprinkling over foods to give an extra healthy boost. Hand roasted in Suffolk with six Moorish flavours to try. Honey seeds for cereals, savoury seeds for salads & spicy seeds for nibbling plus choccy coated seeds with dried fruit. Nutritious seeds for all ages and stages - Munch on! Munchy seeds have been roasted in Suffolk by husband and wife team; Crispin & Lucinda Clay for over 14 years. Originating in New Zealand, Lucinda’s grand mother used to roast seeds for her grandchildren to keep them out of the sweetie jar! 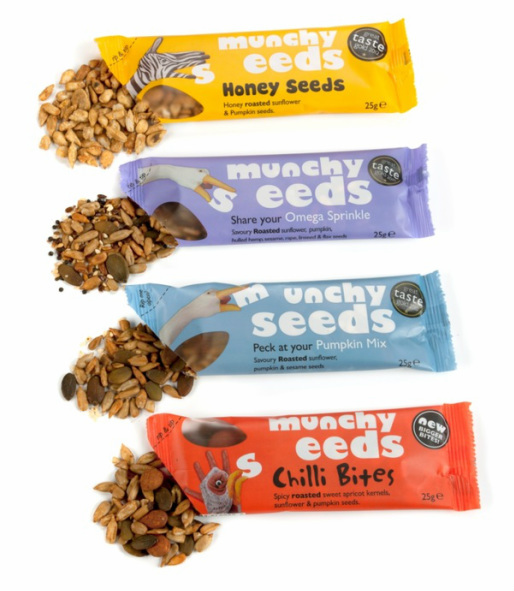 Munchy Seeds have six different flavours in the range; savoury, sweet, chilli & choccy seeds. Sold in single serve snack packs, family sharing tubs and catering tubs. The roasted seed blends are also sold into local bakeries for adding into ‘seeded farmhouse loafs’. Available nationwide though Farm Shops, Lakeland, Whistle Stops, Waitrose, Tesco and online. Seeds are naturally high in vitamins, minerals, fibre and essential fatty acids. Wheat and gluten-free, they are also suitable for Coeliacs and Vegetarians.